will take your breath away." Rimba Orangutan Ecolodge is perched over the gently flowing Sekonyer River on the edge of the Tanjung Puting National Park. It is remote - only accessible by traditional Klotok boat. The property feels as though it is straight out of a movie set, with exotic covered boardwalks connecting the rooms with the restaurant and social spaces. This is the place for Orangutan tours in Indonesia! Rimba is truly special, located in one of the few remaining places on earth where Orangutans can be seen in the wild. On a visit here, you may encounter seven other primate species, a rich bird life and explore the lush surrounding rainforest. From your comfortable room, you’ll wake up each day to birdsong and you may hear the plaintive cry of Gibbons and enjoy the resident Macaque monkey troop. If lucky, you may even see Orangutans around the lodge itself, or hear the long haunting call of the males in the area. Most evenings, a family of Proboscis Monkeys will settle above the lodge in the trees to sleep. The unique location offers excellent access to a number of Orangutan tours to feeding stations in the National Park. The most famous of these stations is Camp Leakey, established in 1971 by Professor Birute Galdikas, a student of famed scientist Professor Louis Leakey, who also supervised Jane Goodall and Diane Fossey. You can also explore the rainforest by riverboat, or on foot, and choose from birding, hiking and wildlife tours or have a truly unique cultural experience visiting remote villages. Our traditional Klotok Boats are solid, two-storied wooden crafts which hold between two and fifteen guests. Sitting on the top deck provides a gentle way to travel the river and rainforest in style. Touring by Klotok gives you a chance to relax and eat a hearty meal between walks to the feeding stations, and offers many opportunities to stop and view wildlife along the way. For extended tours, the Klotok becomes your floating hotel! Enjoy many of the comforts of the lodge with a proper inner-sprung mattress, and bathrooms equipped with toilets and showers. From the Klotok you can enjoy night walks and a much greater reach into the jungle. Families are welcome at Rimba Ecolodge. A passion for conservation can start at a very young age and we revel in the opportunity to inspire young people with the beauty and excitement of our amazing wildlife and natural treasures. 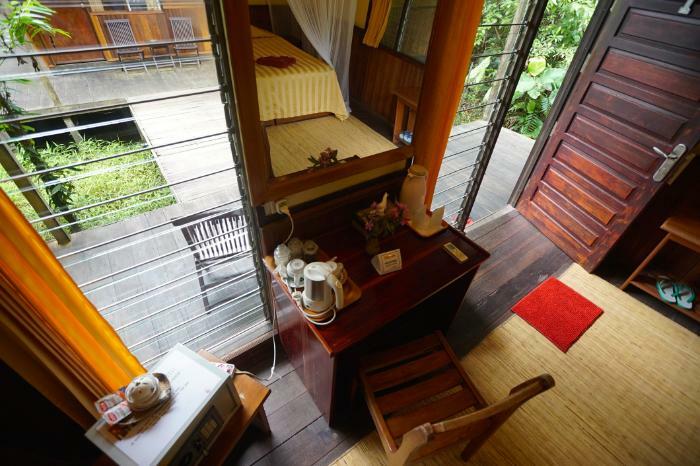 Rimba Orangutan Ecolodge is a timber lodge built in a series of adjoining elevated pavilions. Walkways join the rooms with the restaurant, reception, lounge and office. 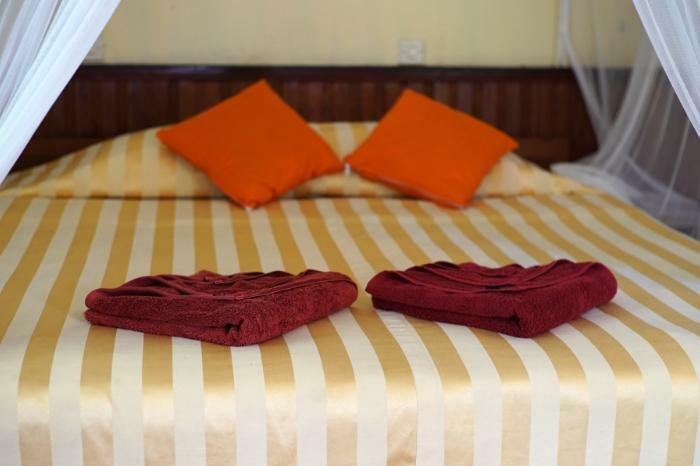 Our clean, comfortable accommodation blends naturally with the surrounding jungle environment. 35 rooms fall into three types: Diamond (3 rooms), Emerald (12 rooms) and Amethyst (20 rooms), serviced by local staff who’ll ensure you enjoy your stay. Book Your Orangutan Holiday Today! Contact our reservations team to book a breathtaking Orangutan holiday. Just fill out this form to ask any questions you may have. Rooms from only USD $60-$140 per night! A stay at Rimba is an opportunity to enjoy unique natural treasures. The walk in from the river takes 45 minutes through swamp forest, past a small medicinal plant area to “The Friends of the National Park” reforestation area. This is a great birding and walking area; Clouded Leopard and Sun Bear Spoors have been seen here. For only US$5 you can choose and plant a tree, leaving a long-term contribution to this reforestation area that was severely burned in 2006. The Tandjung Harapan feeding station is at Park Headquarters and the daily feeding is at 3 o’clock. Here you will see interactions between Orangutans and local people and different aspects of Orangutan behaviour, including a large resident alpha male. Keep an eye out for the famous giant squirrels of the area. Afterwards, you’ll visit Harapan Village, where many of our lodge staff live. More than 10,000 trees have been planted in this location through our company’s conservation fund; something we are very proud of. This tour is all about the animals! You’ll see birds, butterflies and reptiles (including Crocodiles) as well as wild Orangutans, Proboscis monkeys, Langurs, Bornean Gibbon and Macaque. Camp Leakey is possibly the most famous place for Orangutan research in the world. A visit to The Education Centre is a must, before proceeding to the Feeding Centre which is part of the lifelong work of Professor Dr. Birute Galdikas. This is the site of the longest single biological experiment worldwide – a study of the release of orphan Orangutans. Here, you can see up close a mix of wild Orangutans (looking for a free feed) and released animals. If you are lucky (a 25% chance) the alpha male will arrive, a fantastic sight! After the magic of the feeding station, we walk back to the boat for an evening river trip back to the lodge, to be greeted by the roosting Proboscis monkeys. This area is great for hiking! On the way, look for our endemic giant squirrels, native pigs and a huge variety of butterflies. This feeding station offers another chance to see a large alpha male, always an imposing and fascinating figure! You may also choose to take an additional 2 KM walk to see an Oil Palm plantation. The Pondok Tangui Feeding Station tour can be combined with Camp Leakey if you wish to make it a full day of orangutan adventures. All three sites are unique and offer a once-in-a-lifetime experience. Ask our bookings team how to ensure you see them all during your stay. You may add this magical experience to your Tangui Feeding Station tour. This is an incredible way to end an exciting day in nature! Enjoy a romantic dinner while cruising down the river, the jungle surrounds lit up with millions of fireflies dancing in the Nipah palms. For a better understanding of the people and history of the area, the Harapan Village can be added to your feeding station tour. The inhabitants of this village originally lived in the park itself. Most of the families are employed in the palm oil plantations, although some work in ecotourism with us. Here you can see the dreadful impact of the rapacious expansion of the palm oil industry. Are you a keen birder? Our guides are renowned for their expertise. We offer all-inclusive private birding tours tailored to suit your schedule and interests. These tours take you to the southern end of the park and are usually 3 – 5 days including living on a Klotok Boat. This is a short walking tour of the boat after dinner to view night creatures usually in the area of Camp Leakey. You may see night birds (owls and nightjars), glowing mushrooms, slow loris, tarantulas; rarely a Tarsier (the smallest primate) and very rarely a Clouded Leopard. Q: Is there WIFI at Rimba? A: Yes! We offer satellite internet! Please note: this is an expensive service to run in the jungle, to keep it fair we offer a user-pay service – you only pay the fee if you wish to use it. Q: What is appropriate dress for Rimba? A: There are a few considerations for your visit to Rimba. Firstly, we live in a Muslim area so please dress accordingly - avoid short shorts (long shorts are ok) and wear a long sleeve shirt with roll-up sleeves. Also, like many tropical places, there is a very low risk of malaria. We suggest long trousers and long sleeves for the evenings. Also, please wear repellent on exposed skin and follow the advice of your doctor regarding medications. Q: Can I have a drink at Rimba? A: According to the rules of our local government, no alcohol can be sold at Rimba. However, we have an array of non-alcoholic beverages. Q: How should I prepare for the feeding stations? A: Our guides will carry water for you and provide food on the boat. It is important that food is not taken into the feeding stations, or consumed anywhere near an orangutan. Humans transmit diseases to Orangutans, so please do not initiate contact (for their sake). Q: What should I do if an Orangutan touches me? A: Occasionally, if you are very lucky, an Orangutan may take you by the hand – in this case, relax and enjoy it! Q: How do I book transport? A: Due to our remote location, we arrange most internal transport for our guests. Our centralised booking team will help you plan the perfect visit to Rimba. Q: How do I book tours and guides? A: Our central reservations team will pre-book the perfect tour to suit your schedule, group size and interests. Contact our booking team to plan your desired experience. 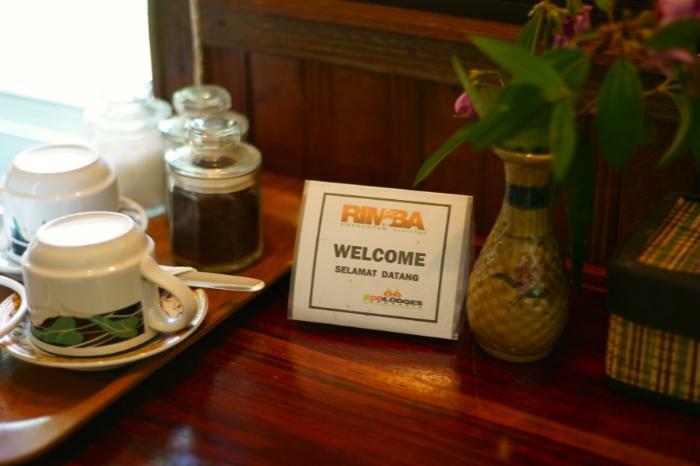 Q: What food is served at Rimba? A: Preparing excellent food is of great importance to our chefs. Both in our Lodge restaurant and on our Klotok tour boats. We provide delicious local food and cater to vegetarians and all other special dietary requirements… simply provide us with details of your needs when booking and our chefs will prepare hearty meals accordingly. When needed, we also offer enticing picnic lunches, appropriate for your chosen adventures. Each lodge is measured by our internal strict eco standards system of 30,000+ points developed from our 10 relationship with Green Globe 21. You can read more about our Eco Endeavours here. A: $10 from every client of our travel company Ecosafari Indonesia is donated to the company conservation fund. Also, a percentage of our profits goes to specific conservation projects like planting new trees in the park to replace those burnt in the devastating fires of 2015. Q: What is a suitable age for children to be at Rimba? A: Babies carried by their parents are welcome, but please be aware of mosquitoes and the sun. There is one cot available, and a high chair. RIMBA IS NOT RECOMMENDED FOR TODDLERS UNDER 5 YEARS. Children over five who can walk at least 30 minutes and obey instructions from the Guide will enjoy and learn from this experience. Children must be supervised by a parent in sight at all times.